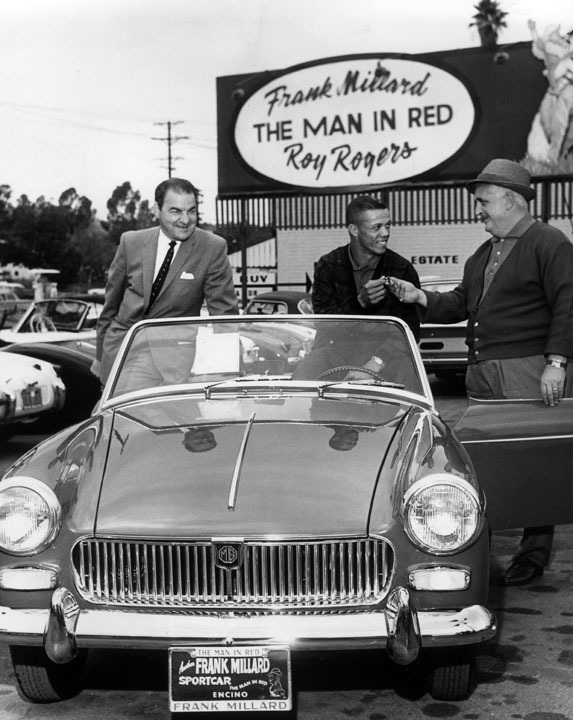 In a season-long battle of ballots, Maury Wills stole a short lead and slid home just ahead of Tommy Davis as the most popular Dodger in an annual event sponsored by Roy Rogers and Frank Millard of Frank Millard Sports Car Center in Encino. Maury was presented a brand new MG roadster for stealing the show. Tommy Davis, as runner up, made a powerful stretch drive and was rewarded by Rickey Biagi with a gift certificate for fifty-two weeks of gourmet dining at his Rickey’s Valley Inn on Sherman Oaks Blvd. Photo dated: October 16, 1962. This entry was posted on Sunday, December 6th, 2009 at 9:00 am	and is filed under Celebrities. You can follow any responses to this entry through the RSS 2.0 feed. You can leave a response, or trackback from your own site. What has happened to intererst in modern cars (after ’65)? MY uncle Nick walsh owned a tucker. Just got done reading a new release on the Tucker “Kilo-Quad Tucker treasure” DID you know tootsie rolls are made in the old Tucker plant?